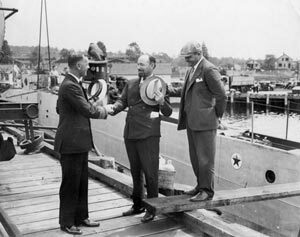 Sir Hubert Wilkins (center) (1931). Image courtesy Arctic Submarine Laboratory. Sir Hubert Wilkins acquires a submarine from the US Navy and prepares her for an undersea expedition to the North Pole, renaming her Nautilus. The leader of the scientific staff is Harald Sverdrup, who is to make measurements from a specially rigged diving compartment. The submarine heads into the pack ice north of Spitsbergen in August 1931, but the diving plane becomes damaged. The submarine can no longer cruise very far under the ice, and so can make oceanographic observations only outside of the ice pack. However, the Nautilus does make several short runs under ice, demonstrating that submarines can operate in and under the ice pack.